It’s not easy to find a truly helpful DVD ripper for Mac. There’s always some kind of compromise – usually related to the speed, DVD support, or output choices or quality. But a good DVD ripper is a must to have DVD played on the phone in your pocket, the big sharp TV at home, or the sleek little ultraportable MacBook you got from work. The tool many people choose is Handbrake for Mac. And while it’s more than enough for bare-bones DVD ripping tasks, when it comes to a more demanding DVD converting, I’m talking about serious copy protections, fast speed and extensive outputs, Handbrake as well as many Mac DVD rippers don’t have the guts. To that end, I’ve been spending a lot of time with the macOS DVD rippers on the market. After a battery of testing, I found it! 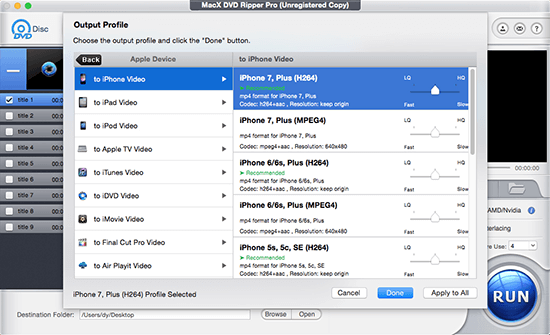 The DVD ripper for macOS I will introduce here is named MacX DVD Ripper Pro – a program that really works with different kinds of discs. Compared to the measly MP4 and MKV in Handbrake, I have the richest output options with MacX DVD Ripper Pro. The Handbrake alternative can rip DVD on Mac in MP4, MOV, AVI, MKV, 3GP, FLV etc. Want to save an intact DVD copy on hard drive? The 1:1 ISO image has all the DVD info, subtitles, menus, extras, etc. contained. There are built-in profiles for the latest iOS, Android, Windows and Sony devices, covering iPhone X, iPhone 8, 8 Plus, Samsung Galaxy Note 8, S8, Huawei Mate 10, not to mention any other previous models. Even when you want to stream movies from Mac or NAS drive to Apple TV box or smart TV, or upload to YouTube, Vimeo, FaceBook, you’re taken care of. I always have happy converting experiences with Handbrake for Mac, before throwing any encrypted discs into it. As we all know, DVD encryption schemes have been making ripping protected DVD a Sisyphean task for Handbrake. In fact, copy protections can be a hot potato, or a no-brainer, depending on which Mac DVD ripper you choose. MacX DVD Ripper Pro is the only DVD ripper I find on macOS that can deal with almost all the copy protections. I have tried the new DVD releases, Disney 99-title DVDs, workout DVDs, TV series DVDs, and some unplayable DVDs, and only a couple of titles required me to check its Safe Mode manually to get through. For me, there is nothing worse than trying to convert a DVD title to iPad for a Saturday night but having to see the progress bar crawl along slowly and fight lag. With MacX DVD Ripper Pro, ripping DVD gets a lot less daunting, even when you have a collection of thousands of titles to backup. It takes advantage of Intel’s QSV hardware acceleration tech, which has enough power to boost the whole DVD ripping on Mac while still carrying enough juice for other routine computer activities. So it instantly has a leg up on its competitors, showing a 5x faster speed. While Handbrake is popular for its reliable performance, it’s still nowhere as fast as MacX DVD Ripper Pro. According to my test, to rip the same DVD (for example, the movie Thor) to MP4, MacX DVD Ripper Pro took 9.2 minutes while Handbrake spent 20 minutes. The Mac DVD ripper strikes a balance between the needs of novices and experts alike. Different to the a-little-bit-confusing design of Handbrake, MacX DVD Ripper Pro is easy to read. Even beginners can get started ripping immediately. Read on to know how easy it is to rip DVD on Mac with this thoughtful DVD ripper. First, load DVD by clicking the Disc button on the tool bar. Select an output format, or if you don’t know any format stuff, select the destination of the DVD movie, like iPhone from the popping-up window. Hit RUN to run the conversion. MacX DVD Ripper Pro has won the top scores in all the criteria for a good DVD ripper for Mac. It has the vast inputs & outputs, fastest speed and strong protection removal capability. Once you get the knack, you will find it a true helper for saving time and efforts in DVD ripping. If you want to see how the ripping program really pans out, you can visit its website to find out more.